Patriot Blue Pearl Coat exterior, Big Horn/Lone Star trim. 4x4, Back-Up Camera, iPod/MP3 Input. EPA 21 MPG Hwy/15 MPG City! SEE MORE!======KEY FEATURE… S INCLUDE: 4x4, Back-Up Camera, iPod/MP3 Input, Aluminum Wheels. MP3 Player, Keyless Entry, Privacy Glass, Child Safety Locks, Electronic Stability Control. 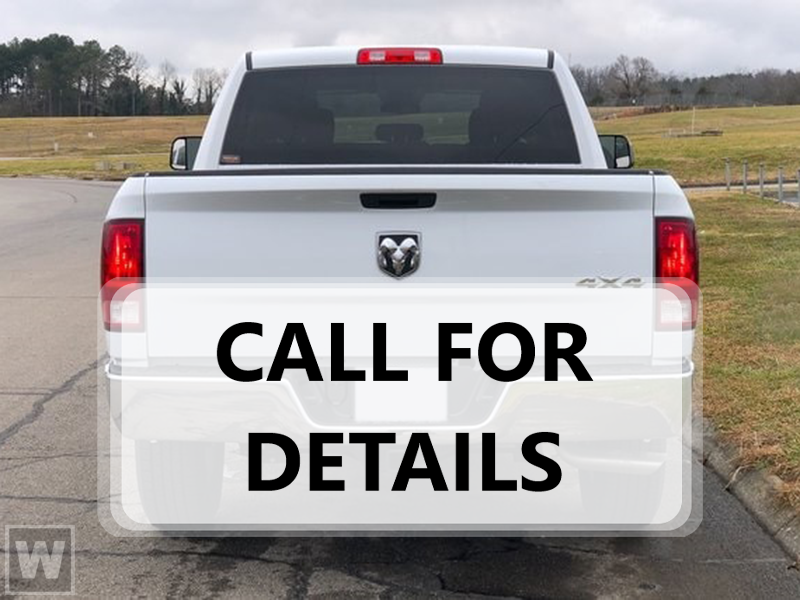 ======OPTION PACKAGES: ENGINE: 5.7L V8 HEMI MDS VVT Hemi Badge, Dual Rear Exhaust w/Bright Tips, GVWR: 7,100 lbs, 180 Amp Alternator, Heavy Duty Engine Cooling, Active Noise Control System, BIG HORN LEVEL 1 EQUIPMENT GROUP Rear Window Defroster, Cluster 3.5 TFT Color Display, Power 8-Way Driver Seat, Rear Power Sliding Window, Sun Visors w/Illuminated Vanity Mirrors, Glove Box Lamp, Integrated Center Stack Radio, Class IV Receiver Hitch, Single Disc Remote CD Player, Power 4-Way Driver Lumbar Adjust, Power Adjustable Pedals, Foam Bottle Insert (Door Trim Panel), Google Android Auto, For More Info, Call 800-643-2112, Exterior Mirrors Courtesy Lamps, 1-Year SiriusXM Radio Service, Auto Dim Exterior Driver Mirror, Radio: Uconnect 4 w/8.4 Display, SiriusXM Satellite Radio, Exterior Mirrors w/Supplemental Signals, Big Horn IP Badge, Rear Dome w/On/Off Switch Lamp, Universal Garage Door Opener, Power Heated Fold Away Mirrors, Rear View Auto Dim Mirror, 8.4 Touchscreen Display, OFF ROAD GROUP Front Extra HD Shock Absorbers, E-Locker Rear Axle, Rear Extra HD Shock Absorbers, Fuel Tank Skid Plate, Transfer Case Skid Plate, Front Suspension Skid Plate, Tow Hooks, Steering Gear Skid Plate, Off Road Decals, Hill Descent Control, Tire: Full Size Spare, REMOTE START SYSTEM, QUICK ORDER PACKAGE 25Z BIG HORN/LONE STAR Engine: 5.7L V8 HEMI MDS VVT, Transmission: 8-Speed Automatic (8HP75), Steering Wheel Mounted Audio Controls, TRANSMISSION: 8-SPEED AUTOMATIC (8HP75). Plus TT&L and fees. Price contains all applicable dealer incentives and non-limited factory rebates. You may qualify for additional rebates; see dealer for details.